So the New Year’s resolution? Divestment. Eventually reserves of coal, oil and gas will collapse in value because they won’t be able to be used, and the fossil-fuel lobby will lose its grip on power. What we need to do is to move that process along much faster, so that renewables and zero-emissions become the only attractive investment. So please – for your own self-interest – and for the current crop of kids who will live the nightmare if we don’t move more quickly – please do what you can on divestment in fossil fuels. – Write to your superannuation fund. Ask them if your money is invested in fossil fuels. Tell them that you’re concerned that the value of your superannuation investment will collapse, and that fossil fuels are contributing to the destruction of life on earth. – Write to your bank, asking them the same questions and the same concerns. 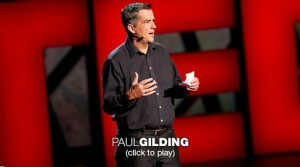 If you need some extra inspiration, listen to Paul Gilding’s response to the Doha outcome, and watch his TED talk. This entry was posted in Activism, Climate change, Environment, Renewable Energy and tagged activism, capitalism, climate change, divestment, economics, environment, Paul Gilding, renewable energy, solar power, TED Talks by Brian Loffler. Bookmark the permalink.